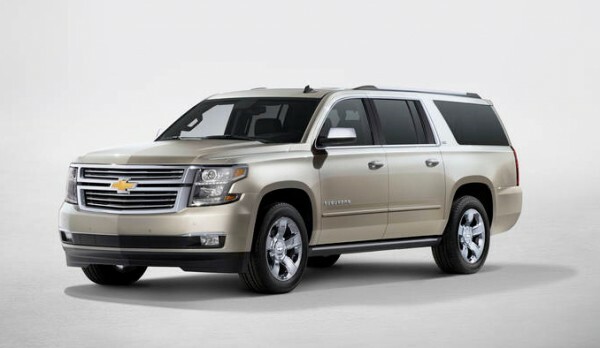 Take A Look At The All New 2015 Chevrolet Suburban / Tahoe – The Bunch Blog! Arguably two of Chevrolet’s most recognizable nameplates outside of performance cars are the Suburban and Tahoe. Both SUVs have long histories at the bow-tie brand and both have been in dire need of updates since entering the marketplace in 2007. For 2015, both finally get updated from the ground up. Like the rest of GM’s body on frame truck and SUV family, the 2015 Suburban and Tahoe are switching to the company’s latest truck frame. Internally known as K2XX, this new frame provides a slightly stronger foundation for the new SUVs and GM claims big leaps forward in ride and handling. If the 2014 Silverado is any indication, we’re inclined to believe their assertions and look forward to driving them for confirmation. Along with the new frame is GM’s new EcoTec3 5.3-liter V-8, also borrowed from the new Silverado. As in the trucks, it will generate 355 horsepower and 383 foot-pounds of torque, funneled through a six-speed automatic. The more powerful engine also nets slight increases in towing capability with both SUVs, though most owners probably don’t tow on a routine basis. On the surface, both SUVs take an evolutionary approach to their exterior designs. Whereas the new Yukon looks like the rest of the GMC family, the Suburban and Tahoe are a mix of several Chevrolet design traits, including a grille similar to the current SUVs and a new, controversial headlamp treatment. Collectively, the new face looks more crossover-like than the outgoing version, however the body looks more truck-like thanks to in-laid doors and a windshield rake that is less car-like than today. The side panels are also far more dynamic than today, with creases along the beltlines and near the D-pillars that add a little more visual interest from the slab-sided SUVs of today. The interior is a less evolutionary tale than the exterior, likely because GM went to a one-interior layout for the new Silverado. The new SUVs get their own interior design that shares nothing with the trucks. Instead, Suburban and Tahoe sport a new, very crossover-like interior that should prove a favorite with SUV buyers. As expected, the interior design is shared entirely with the GMC Yukon, however the Chevrolets have a few differences. Real aluminum and wood trims, as well as the more fashion-forward colors are reserved for the Buick-GMC showroom, while Suburban and Tahoe have to make do with the fake stuff. It is worth noting that all of the plastics appear to be high quality in both brands, though. Space-wise, both Suburban and Tahoe interiors are about on par with today’s versions. Each SUV gained and lost a few inches of interior dimensions; legroom increased in the second row seats, however, third row legroom decreased a bit, for example. The bigger news is that both the second and third row seats fold flat into the cargo floor because GM raised it by four inches to accommodate the folded seats. Buyers can opt for power-folding seats on higher trim levels of both Suburban and Tahoe. In addition to the new power-fold seats, both SUVs gain a boatload of new options for 2015. The entire suite of safety features GM has been adding to just about every product are all in tow; lane departure warning, forward collision alert, blind zone alert and GM’s patented Safety Alert Seat. On the entertainment side of the option list, Chevy now offers its next-generation MyLink infotainment system, which comes with an eight-inch touchscreen, as well as a new Blu-Ray entertainment system for the rear seat. In all, Chevrolet claims every passenger will have access to connectivity features, with a barrage of USB ports and power points to power an entire family’s gadgets. Both Suburban and Tahoe will go on sale in the first quarter of 2014.